New York video artist Mary Lucier has been visiting North Dakota and observing the changing northern Great Plains for five years. She was commissioned by the North Dakota Museum of Art to create a work that responds to the shifting farm culture and populations of this region of the country. The result is her video installation, The Plains of Sweet Regret. At the turn of the twenty-first century, Mary Lucier began to visit North Dakota, traveling across seasons and time, venturing into the far northwest corner of the state, almost to Montana, almost to Saskatchewan. The North Dakota Museum of Art had commissioned her to respond to the population shifts that are forcing the people of the Northern Plains to re-imagine their lives. Seismic change has swept away family farms and ranches, small towns and rural schools. The land is now occupied by agribusiness with its massive machinery, global positioning systems for precision crop management, worldwide marketing networks, and government safety nets. The lone farmer, the cowboy, crews of custom combiners, migrant workers and field hands gradually move on. The remains of that earlier life dot the landscape like the skeletons of fish washed up on far distant shores. The Plains of Sweet Regret is the artist's answer. Mary Lucier's eighteen-minute, five-channel video installation employs four video projections, two plasma screens, surround sound, and various rescued objects and artifacts. With these she creates the experience of moving through the landscape, across the Prairies and the Plains, into the birthing pens and the rodeo arenas, and finally, back into the West of the imagination – the West, which, if it ever existed, lies in ruins. How does an artist grapple with the essence of loss and then expose the ambiguity at its core? Mary Lucier wanders with her camera into these deserted places – empty, forlorn, littered with the remnants of human life. She films a doll, a school desk, a bowling trophy, cast aside, all stripped of their former usefulness. The churches and the schools and the homes, once filled with immigrants' dreams, now house the wind. Only nature's creatures come to call. The Plains of Sweet Regret is a lyrical ode to this lonely and desolate place, to a shifting in time, and to an untested future. Laced with melancholy, with heartbreaking longing, with loveliness, The Plains of Sweet Regret nudges the viewer into remembering. What is it about this life that one cherishes? What must not be lost as we move into this new century? A calf is born. The rancher's large hand gently reaches in to help. The empty landscape, mutating from fall into winter against a haunting, electronic score, is achingly beautiful. Then, in the last six minutes, the work explodes into dance, the dance of the bucking horse, the bull, the clown, the rodeo rider. This is the resplendent West, but Lucier undermines its glory with loss. Brilliantly, the artist sets her choreography to George Strait's Country Western song, "I Can Still Make Cheyenne". The music and the images cascade back over themselves, folding, repositioning, repeating, alive with rapture . . . and, again, longing. She never knew what his calls might bring. But it's alright honey if I hurry I can still make Cheyenne. Gotta go now baby if I hurry I can still make Cheyenne." This is Lucier's second tangle with human loss on the Northern Plains. Following the 1997 flood of the Red River of the North, the North Dakota Museum of Art commissioned Lucier to create Floodsongs. Her work captured the devastating aftereffects of a flood that caused the largest human evacuation in the United States since the Civil War and turned eastern North Dakota, southern Manitoba and northwestern Minnesota into a vast inland sea. Floodsongs, conceived by the artist as a contemporary oratorio, opened at the North Dakota Museum of Art before moving to New York's Museum of Modern Art. Soon after, the International Art Critics Association named it the Best Video Exhibition in an American Museum in 1998-99. So once again, Mary Lucier has entered into the lives of the inhabitants of the Northern Plains and, through art, transformed their experience into myth – undeniably the most authentic human experience of all. Funding by the Commission by the North Dakota Museum of Art with funding from the National Endowment for the Arts and the City of Grand Forks through the North Valley Arts Council. Production has been funded by Creative Capital and the Rockefeller Foundation. Curated by Laurel Reuter, Director, North Dakota Museum of Art. Presented at the University of Wyoming Art Museum with funding in part from the National Advisory Board of the UW Art Museum and Wyoming Public Radio. Left: Mary Lucier, The Plains of Sweet Regret, 2004, video installation stills, courtesy of the North Dakota Museum of Art. 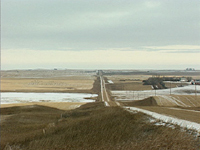 Center: Mary Lucier, The Plains of Sweet Regret, 2004, video installation stills, courtesy of the North Dakota Museum of Art. Right: Mary Lucier, The Plains of Sweet Regret, 2004, video installation stills, courtesy of the North Dakota Museum of Art.